Here is a permanent link to open a PDF of Bruno Colson's review, "Clausewitz on Waterloo," War in History 19 (July 2012), pp.397-400, doi: 10.1177/0968344512447183 Full on-line text of Carl von Clausewitz and Arthur Wellesley, first Duke of Wellington, On Waterloo: Clausewitz, Wellington, and the Campaign of 1815, ed./trans. Christopher Bassford, Daniel Moran, and Gregory W. Pedlow (Clausewitz.com, 2010), 297pp. This link is provided by Sage Publications and by the editors of the journal War in History. Editors: Simon Ball, University of Leeds, Mary Kathryn Barbier, Mississippi State University, Phillips O’Brien, University of Glasgow, and Dennis Showalter, Colorado College. Now 20 years old, War in History is a peer-reviewed journal that publishes articles on war in all its aspects: economic, social, political and military, including the study of naval forces, maritime power and air forces, as well as more narrowly defined military matters. There is no restriction as to period: the journal welcomes a range of submissions, from a study of classical or feudal warfare to the Napoleonic age and beyond. The journal also publishes review articles and book reviews. Carl von Clausewitz and Arthur Wellesley, 1st Duke of Wellington. 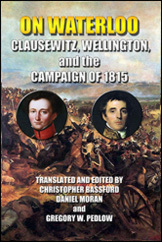 On Waterloo: Clausewitz, Wellington, and the Campaign of 1815.